Health info. This fruit belongs to the family of Mangifera, consisting of 35-40 of the tribe Anacardiaceae. It has scientific name called "Mangifera indica". Besides its delicious taste, mango is also one of many fruit which the most nutritious fruits. A cup of mango juice supply vitamin C is almost 25% of the recommended daily requirement, two of three part of the daily diet for vitamin A, and also good amount of vitamin B6 with vitamin E, phosphorus, pectin, potassium, and magnesium. The mango fruit is also enriched by pythochemicals, such beta-carotene, astragalin and quercetin, which can help protect your body against free radical damage causes cancer. Mango trees including higher plants which have stem structure (habitus) belongs to the group arboreus, ie woody plants that have a stem height of more than 5 meters. Mangoes tree can reach height 10 to 40 meters. The name is derived from the Malayalam fruit maanga. This fruit was brought to Europe by the Portuguese and absorbed into manga (Portuguese), mango (English) and others. Own scientific name roughly means: "(trees) which bear fruit mango, originated from India". 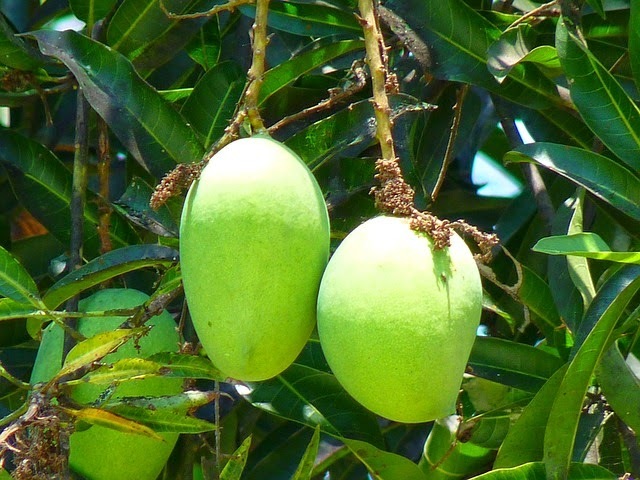 Derived from around the border of India with Burma, mango has spread to Southeast Asia since at least 1500 years ago. The content of vitamin C, pectin and fiber found in mango fruit has high levels and helps to lower cholesterol, especially bad fats (LDL) so as to prevent a stroke. The study found that the antioxidant compounds in mango (fisetin, isoquercitrin, gallic acid, quercetin, astragalin and also methylgallat) turned out to have a property to protect the body against disease prostate cancer, breast cancer, colon cancer, and leukemia. Mango leaves can help normalize insulin levels in the blood. How to boil the mango leaves, soaked all night and then drink it when you wake up in the morning. Efficacy of other mango fruit is not going to increase the body's sugar levels rapidly because the glycemic index is relatively low. In a recent study the function of vitamin E are known to help performance in intimate relationships, mango fruit contains vitamin E which is appropriate and balanced to achieve this. Efficacy mango for skin care are able to clear clogged pores and eliminate acne. In order to get healthy skin and well maintained, the fruit can be eaten, used as a juice or applied directly to the skin surface. The abundance of vitamin A and vitamin C in the mango plus it contains 26 kinds of carotenoids very effectiveness to keep your immune system in order to remain strong and healthy. Green mango juice mixed with water and sweetener able to cool the body and prevent heat exhaustion due to the body burning sun. Another benefit of mango fruit for health is maintaining eye health (its vitamin A content of 24% of sufficient minimum requirement of the body), as the source of alkaline body, improve the digestive system (rich in natural fibers), and maintaining the immune system. Mango also contains iron which is important in the treatment of anemia disease, Its iron deficiency anemia. The vitamin C on mango enhances the absorption of iron, making this fruit is so beneficial for pregnant women and peoples who suffer because anemia. This fruit contains with high vitamin A, it is a powerful anti-oxidant known to improve eye health and protect against age-related macular degeneration. Mango fruit also contains Glutamine acid, this is known to improve memory and keep the brain cells active. Mango fruit is very helpful to make digestive system healing from disease. This fruit contains digestive enzymes that help break down proteins to facilitate absorption in human body, and thus improving the human digestive system. The fiber in mango also helps in digestion. Because this mango fruit high in potassium, it may help in regulating blood pressure levels. Eating mangoes regularly can help lower blood pressure in human body. compound found in mangoes such as citric acid, malic acid and tartaric acid helps to hold the alkaline reserves in the body. Hopefully useful. Thankyou for read.